In geology, the crust is traditionally seen as the outermost solid shell of the Earth which is, in turn, considered to be different to the underlying mantle. 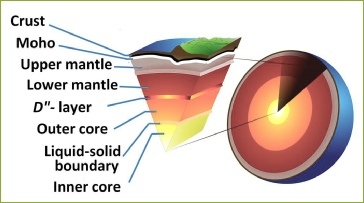 The continental and seafloor crustal rocks are often referred to as the lithosphere where the boundary between the base of the continental and seafloor crusts and the mantle is conventionally placed at the Mohorovičić discontinuity—or simply the Moho as shown in the figure below. This boundary is defined by a contrast in seismic velocity. The underlying relatively rigid uppermost part of the mantle is, in turn, referred to as the asthenosphere. With the advent of modern geophysical and oceanographic studies of the oceans it is now known that the seafloor crust is, in fact, completely separate and distinct from the continental crust. This relatively insignificant continental and much younger volcanic seafloor crustal skin is all that is available to measure and observe the unfolding geological history preserved on our Earth; all else is mere speculation or hypothetical guesswork. The Geological Map of the World, shown below in equal area Mollweide projection, is used exclusively in Expansion Tectonic research and was first published by the Commission for the Geological Map of the World and UNESCO in 1990. 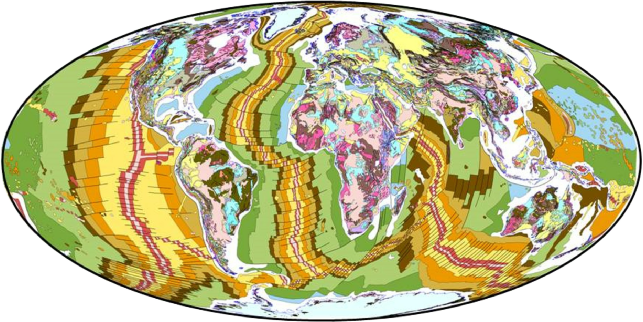 The geological information shown on this map is what is known as time-based geology. In other words each colour represents rocks that have been deposited, intruded or extruded during a set interval of geological time. The colours shown for the continents represent rocks that were formed during the major geological eons and eras, while the striped colours shown for the oceans represent rocks that were formed during the lesser geological periods and epochs. Geological Map of the World showing the distribution of the various ages of rocks occurring beneath the layer of surface soils. In this map the most ancient continental crustal rocks are shown as areas of pink and red colours, mainly occurring in Canada, Africa, the Baltic region and Australia. These islands of ancient crustal rocks are in turn shown to be surrounded by deformed, less ancient and often metamorphosed sedimentary rocks shown as khaki to brown, blue, and yellow colours. A continental craton is defined as a part of the Earth’s crust that has attained relative crustal stability and the rocks have been little deformed for a prolonged period of time. By definition, cratons must have reached crustal stability by about 2,400 million years ago (the end of the Archaean Eon) and since then have undergone little deformation compared to adjacent parts of the crust. A continental orogen refers to a belt of rocks characterised by regional folding, metamorphism, and intrusion of magmatic rocks. The rocks of an orogen can include deformed, eroded, and reworked parts of older, early-formed cratons, as well as young volcanic and sedimentary rocks. A distinct tectonic phase of Earth movement, over a relatively short period of time, first establishes an orogen. It is also possible for an orogen to become re-activated during subsequent tectonic events and the belt normally remains as a permanent zone of relative weakness within the Earth’s crust. A continental basin refers to an area that is underlain by a substantial thickness of sedimentary rocks. These rocks possess unifying characteristics of both sediment type and deformation history. Within a basin, sediments are deposited during a regionally restricted period of time, often extending for tens to hundreds of millions of years, during crustal depression or a related sequence of such events. The term basin is usually synonymous with the term sedimentary basin and it represents a regional topographical down-warp of the Earth’s surface, generally filled with water. Volcanic seafloor crust is completely separate and distinct from the continental crust. Modern geophysical and oceanographic studies show that all seafloor crust is younger than 200 million years old and comprises almost entirely of the iron-rich volcanic lava called basalt. This seafloor crust represents cooled and solidified lava extruded from the upper mantle, with nothing to do with the continental crusts. From these definitions it should be appreciated that not all continental and seafloor crusts are the same and not all rocks were formed by the same process or during the same interval of time. This fundamental understanding of continental and seafloor crusts is necessary to provide a mechanism for crustal modelling back in time and to justify determination of an ancient primordial Earth radius during small Earth modelling studies.